As you may remember, this is the home-made plaque I mentioned in my previous post about the foyer. Well, I wanted to experiment with a combination faux and plaster application and thought this would be a good place to start. So, after determining the size I needed, we picked a heavy ¾” plywood sheet and cut it to size (42 x 50). Starting with a good coat of primer I then selected stencils that had been used for a ceiling application, added corner stencils and applied a coating of plaster instead of the usual stencil paint. This took a few days to dry. Now it was time to lightly sand and prime the raised plaster so the paint would not get sucked into the plaster. Once dry, I decided to paint the entire piece using an antique ivory to give it a nice light-colored background then the magic of fauxing began. I layered light paint coats of gold and green umber and topped it off with a light coat of raw umber glaze to give it an aged look. It took a full weekend to finish this project once the plaster was set up. I think it makes quite a statement and hope you like it as well. It does make quite a statement. It’s beautiful! Thanks I love working on projects like that one. It looks great Cindy! I wish we lived closer so you could teach me how to do that! Thanks Karen. Hope all is well. wow! That is just beautiful. 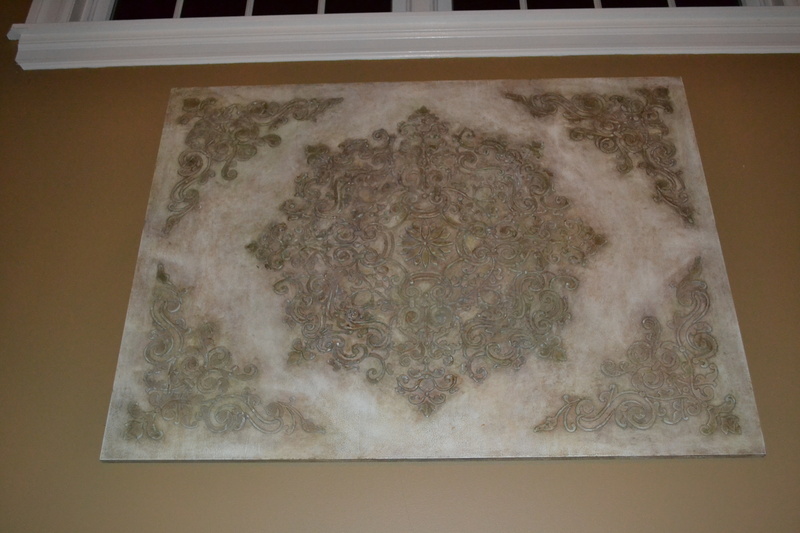 Thank you so much for sharing how you made such a beautiful piece for your home. I would like to try that for myself sometime (but on a smaller scale at first). I saw your post over at “Treasure Hunt Thursday”. Thank you very much it was a lot of work but fun waatching it come together.